What does an artist do when he takes time away to relax? For Art In The Market artist Richard Childs it means that he still carries his sketchpad and creates. 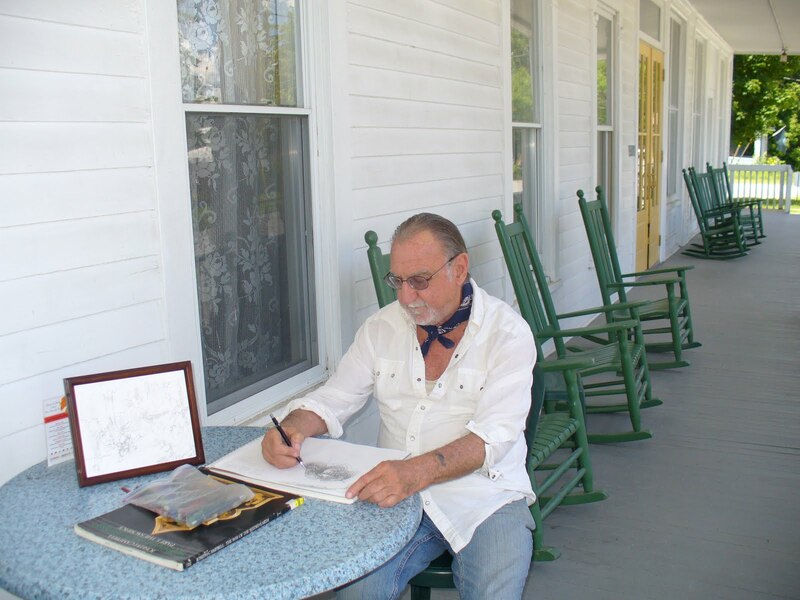 Richard is here in upstate New York on the porch of the 110 year old Cambridge Hotel in Cambridge N.Y. "I don't go anywhere without a sketchpad." says Richard." "In my second home city, St. Augustine, Florida I would have my coffee in the lobby foyer of the Casa Marina and sketch away. Here, I love the old wooden porch at the hotel." A few years ago tourists in St. Augustine could get Richard's paintings or sculptures in The Plaza de la Constitucion but times have changed and artists are banned from most of the historic district. "It saddens me that we had won a hard fought battle in Federal Court battle over artist's First Amendment rights but the city of St. Augustine introduced a new ordinance that continues to violate our rights as affirmed by the court." Childs' is multi gifted in that he is also a talented musician and is the "house pianist" on the Yamaha baby grand in the hotel's lobby. One of our favorite things is his role as a storytelling monologist . Check out" Three Short Stories" on his website, Art by Richard. We hope to see Richard back in St. Augustine soon. The story of a true "working artist" discussing the artist's life. Thank you Suvo for not letting us forget that this is “the land of the free and the home of the brave.” Your tenacity and perseverance for what is just and protected by the highest law, has kept the rest of us in check these past, long and hard years for you: the brave. We know that the best of writers are those who can make themselves understood through rich imagery. Yet the visual artist is seen as an oddity by City Hall, unless it’s big name can fetch many dollars in investments through a gallery business. Street artists have the blessing of passing on a message at low cost, because “A picture is worth a thousand words”, it is sheer imagery, and is accessible to Everyman: freedom of speech for all, as protected by the First Amendment to our US Constitution. We watched you and Karl being hauled off to jail for defending the First and most noble of rules in our Constitution. They had the guns, and they could have killed us all, regardless of the Constitution, compliments of a bunch of incompetents at City Hall. But you stood your ground. Thank you, Suvo, for facing the bullets and for all that you have taught us. Your efforts will not be forgotten nor be in vain. "End Of An Era" 24" x 18" acrylic on wood. Lance and wife Patricia sailed and lived aboard boats for the past 20 years. They now live and operate their art business in St. Augustine, Florida. Lance is also a Vietnam veteran. Lance paints his life story. 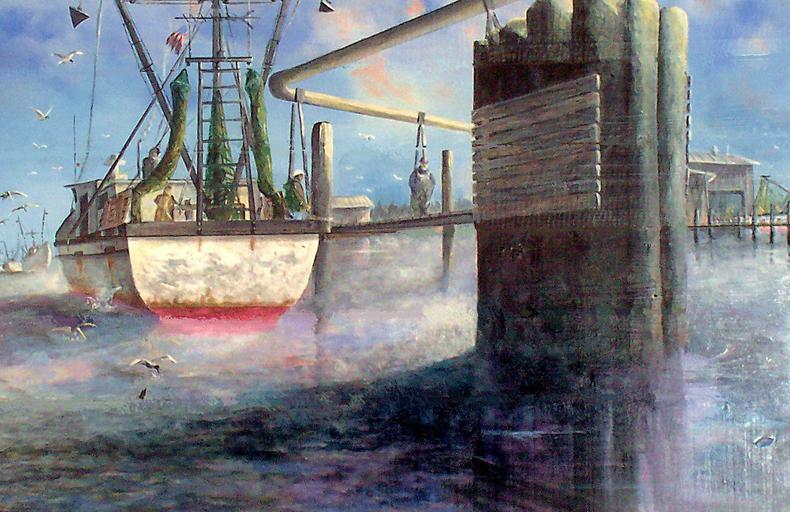 He has worked those winches and climbed the rigging of shrimp boats that searched the Gulf of Mexico out of Florida's West Coast. Calloused hands and a strong back were required. Lance can tell you stories of the many people he has met on the docks. Steinbeck has nothing on him. Art In The Market artist, Charles Dickinson was one of thirty artists invited to a "paint out" on the streets of historic Frederick, Maryland. If you click on tho the award winners you will see that Charles won the People's Choice Award. Frederick, Maryland, long a tourist destination, has been designated one of 25 Small City Arts Destinations by American Style Magazine. 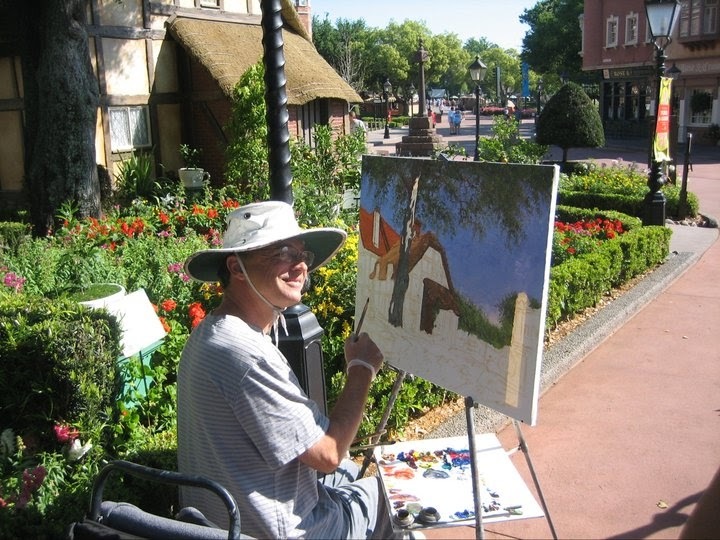 Charles has been setting up his easel in various New England towns over the past month. 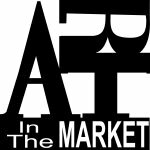 Next stop for Charles,....Bar Harbor, Maine where Art In The Market artist Elizabeth Harris is currently painting landscapes and outdoor scenery. These are truly art friendly communities who recognize that visual artists do not detract but add to the ambiance of a community. Perhaps one day the City of St. Augustine will not have a law prohibiting artists from setting up their easels in the historic district. St. Augustine artists: front row, Left to Right. Scott Raimondo, Kate Merrick,Greg Travous,Ernest Lee, Counsel Tom Cushman.Top row, Dean Quigley,Elena Hecht,Casey Leydon, Rob Johannsen, Nancy Christiansen,Helena Sala. Out of town (not in photo) Bruce Bates, Charles Dickinson, Elizabeth Harris, Richard Childs. 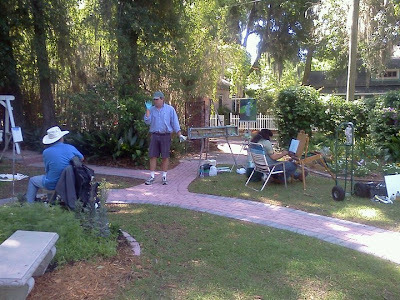 Last Sunday artists and friends of Greg Travous held a picnic under the pavillion at Eddie Vicker's Park in Lincolnville. Food, fellowship and music made the afternoon a pleasant mellow event. To show our support and friendship to Greg Travous, a gathering and pot luck picnic is being held. Bring a dish to share if you like, an instrument to play if you wish, and a story or smile to share. Invite any of Greg's friends along! Some of you may have heard that I recently spent six days in Flagler Hospital. I was feeling poorly and was concerned about a recent 26 pound weight loss. Solid foods were not going down for a couple of weeks and I had been relying on soup. After being punctured and probed for days, I received the grim prognosis, verified by a group of doctors. Cancer had reached stage four and was in four organs. Treatments would be useless at this point. Many of my friends were already aware that I knew of a cancerous condition for the last four years. This means that I have prepared myself for "the finals". I am still walking and talking ( rare at this stage, per my oncologist) and the only effects now is a general weakness and a dull belly ache and nausea with a loss of appetite. I still have work to do though setting up my art in the plaza is no longer physically possible. The ability for my fellow artists to do so is still my high priority and I'm working on this. I am fortunate to have received such great care at Flagler Hospital and Community Hospice. I am also fortunate to have been able to have spent the last six years in a wonderful community that I've learned to love and have met many fantastic friends. I am writing this now because there may be physical changes coming and while I am lucid now, this may change in the future. I wanted friends to know that I want no drama nor "get well soon wishes". I have lived a life that has been what I consider interesting and have had more than my share of adventure. I am not a religious nor spiritual person to which I consider an advantage at this stage believing that no punishment awaits me and I'll leave knowing that I tried to do the best that I could with normal human limitations and flaws. So when you see me (yes, I'll walk and talk as long as I can) try not to treat me any differently. You are all wonderful and I hope to see you around town. I'll buy the coffee and try to make you laugh. Last March, in anticipation of an upcoming trial against me who was accused of "offering art for sale" in St. Augustine's Plaza de la Constitucion, I requested a meeting with the city to perhaps meet some mutually satisfying resolution without, once again encumbering taxpayers with the expense of witnesses testifying, court time, city attorney's, bad press, etc. We've all been there before. Commissioner Leanne Freeman came forth and set up a meeting. The initial meeting covered some of the questions that were addressed by previous decisions by the County and Federal courts both here and in other judicial districts. A second meeting should be scheduled soon since the court dates for me will be coming up again in July. I feel that this is the FIRST time the administration of the City of St. Augustine has shown a willingness to recognize visual artist's rights. 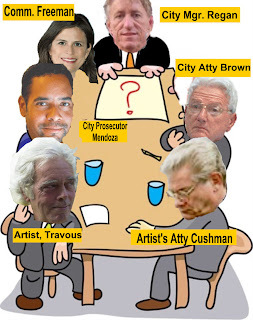 The objective is to draft an ordinance that is constitutionally compliant and will have artist's and their easels back on city streets and plazas. At this time it is illegal for an artists to do so in most of the historic district. Though it was an overly broad, sweeping statement, Mayor Boles' sentiment is well intentioned. 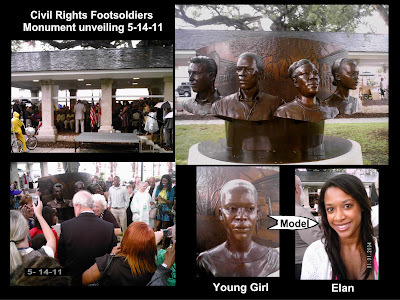 On Saturday, in the Plaza we had the unveiling of sculptor Brian Owens' work commemorating the citizens of St. Augustine who non violently stood up to the jeering racist crowds in the difficult summer of 1964. The bronze in the Plaza is a beautiful tribute to those "ordinary citizens". "Never again can we afford to live with the narrow, provincial "outside agitator" idea. Anyone who lives inside the United States can never be considered an outsider anywhere within its bounds." 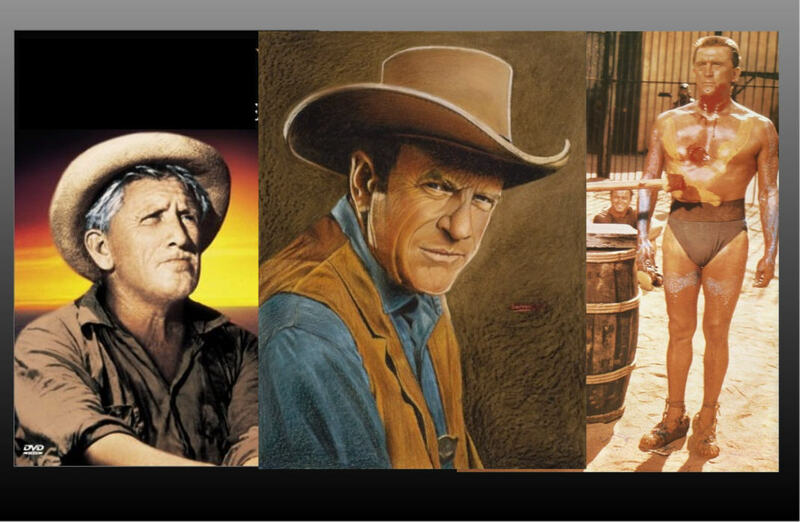 Note: The film clip flows better if you skip the current sheriff's irrelevant four minute speech at the beginning. Should This Be Criminal Activity? ﻿Many communities have found that inviting plein air artists to an event called a "Paint Out" is an attractive cultural event that both citizens and artists enjoy. Just outside of Gainesville, the Evinston Paint Out is currently taking place. Unfortunately, in St. Augustine , Florida this activity is considered illegal in most of the historic district. Shortly after this ordinance was passed an artist in the Crescent Beach Paint out was threatened with arrest. 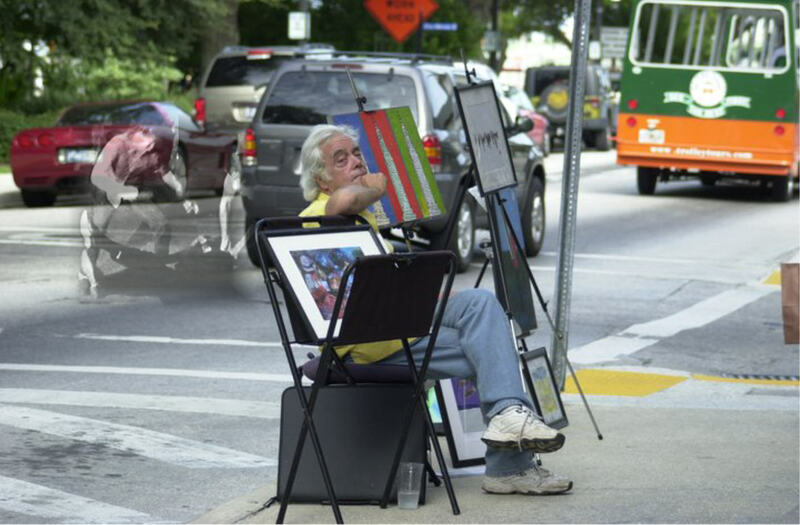 Last week, Dean Quigley set up his easel in Ponce de Leon Circle, well away from pedestrian traffic. Quigley wanted to capture the colonial style building that houses the Cutter & Cutter Gallery. The police came by and Dean was forced to pack up with an incomplete canvas. Can anyone tell us why the City of St. Augustine would criminalize ordinary behavior? Wouldn't it be a good thing for artists to depict our picturesque city in their respective styles? Don't we hear constantly that visitors love to see the artists and the work that they do? This is baffling! UNCONSTITUTIONAL ACCORDING TO UNANIMOUS JURY! After a 7+ year battle in the Federal Court, fighting for the Constitutional Rights of all Fine Artists in America, Shaun Christensen was awarded a unanimous ruling by 12 jurors in a Federal Court case coming out of the U.S. District Court in Utah on Friday March 4th, 2011. This litigation came about after Park City officials arrested Christensen on a cold Saturday in January of 2003 for receiving $15 in compensation for one of his self created 3in.X9in. works of art. He went up to Park City that day, during the famous Sundance Visual Arts Festival, to protest the extreme restrictions that Park City placed on visual Artists...not allowing ANY outside sales by original artists in that City except during their expensive Park City Arts Festival, with its $400+ participation fees. He went there that day to stand up for the Constitutional Rights of All Artistic Citizens and engage in one of the most sacred activities that is protected at the very Core of the First Amendment. He was engaged in a peaceful political challenge to governmental policies, while standing in a public park. 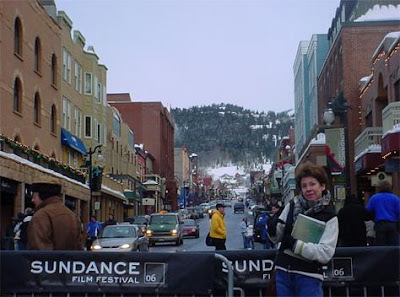 Park City was quick to demonstrate just how EXTREME those policies were, with regards to visual Artists in their City! They arrested Christensen and through him in jail for 2 days! Christensen got an attorney, Brian Bernard of Salt Lake City, and filed his First Amendment challenge in a law suit against Park City in the Federal Courts. Bernard seemed to be less than qualified in dealing with the proper legal issues of the case and the Federal Judge through the entire case out upon the first go round. Then Bernard quickly dropped the case, refusing to represent Christensen on the appeal to the 10th Circuit Court in Denver. That didn't stop Christensen. In a move that should empower Artists across this country, he took on the legal challenge of representing himself, without legal council. That is called "Pro-Se" in legal jargon. So Christensen cited his First, Fourteenth and Fourth Amendment claims in his appeal to the 10th Circuit Court. Well be darned if the higher Court agreed with Christensen on questions of law. The high court granted Christensen's appeal and the case was sent back to the lower Court to be adjudicated under the "proper principles" of Constitutional Law. Christensen has held out against the top law firms in Utah, hired to represent Park City. He has held out against accepting offers by that City to pay him money to settle. Christensen took on this massive challenge in the Federal Courts because he believes that all Citizens have a Constitutional Right to express themselves through the oldest and most powerful forms of human communication...the Fine Arts. He has held his ground for all these 7+ years, steadfastly refusing to compromise or give up the cause of fighting for all artists. The Federal Judge in this case seemingly stacked every card against Christensen. Even refusing to adjudicate this case under the proper principles of First Amendment law found in the Bery v City of New York ruling by the 2nd Circuit Court, (1996), the White v Sparks ruling by the 9th Circuit Court, in (2006), or similar rulings by the 6th and 7th Circuit Courts. This Utah Federal Judge instead chose to throw the case under the "O'Briend" standards...which are applied to the sale of commercial merchandise. Treating Christensen and Artists in general as though they are no different than a Hot Dog vendor on public property. Then the Judge called for a jury of lay people to decide these important matters of Constitutional Law...while ignoring Christensen's requests for summary judgment by this Court. So the fate of all Artists in Utah rested with the decision of 12 jurors. In the heart of Conservative Utah, we all thought Christensen had the proverbial "Fat Chance" of Winning because he had to win a unanimous vote of all the12 jurors...in order to Win the case. The other side had really stacked every possible card against Christensen's chances of winning. The jurors deliberated for several hours before rendering their decision The Judge read the ruling first and seemed to grimace at the jury's decision. The tension in the court room could be sliced with a knife as the Jury Foreman read the decision allowed. It was a unanimous vote by all 12 jurors. Count number 1; The jury found Park City Did Violate Shaun Christensen's First Amendment Rights on that day they arrested him for selling a $15 picture in their park. Count number 2; The jury found that Park City Did violate Shaun Christensen's 4th Amendment Right to illegal search and seizure. Christensen is eager to take this on appeal back up the 10th Circuit on his 14th Amendment challenge that the lower Dist. Judge throughout. Christensen seeks a ruling from the higher Court that places the context of his WIN under the proper Constitutional Principles of Law and awards him a more defined and informative ruling on all three challenges he has brought before the Courts. It sure will feel better this time before the 10th Circuit Court with the winning ruling by 12 jurors under his belt from the lower court. All Artists across this country own Mr. Shaun Christensen a deeply felt thank you for all that he has endured for these past 7+ years because he believes in the principle of First Amendment Law that all Citizens have the God Given Human Right to express ourselves Artistically on public forums without the threat of arrest hanging over us. His WIN is a WIN for all Artists and further defines the protections offered under our Constitution for Artists and the Fine Arts... for generations of Artists yet unborn and on into the history of our Nation. Thanks Shaun and Good On YOU SIR. Nevada State Assembly Bill 351, "Art in the Parks Bill" passed (2006), opening all public parks for Art and the Humanities to become a permanent part of the recreational experience of the public parks of Nevada. Coordinator of the Carson City Free Community Fine Art Shows, each weekend all summer, free open to artists of all ages and skill levels. Peter Guinta's article in today's St. Augustine Record headlined as City: Fairness Vital In Carriage Ordinance quoted Commissioner Bill Leary as saying "Tourists love our carriages. The fundamental thing that sticks in my craw was: This is not how we should treat people." referencing ordinance rules that would drive them out of business." Vice Mayor Leanna Freeman said she also had "an unsettling feeling of unfairness" about the first drafts of the ordinance. As outdoor artist/vendors we support the Carriages and their drivers. The horses seem healthy and it appears that they are given good care. The carriage rides have been around since Henry Flagler opened his hotels in the 1880's.We would like to see the Carriage industry succeed in the ancient city. It's easy to draw parallels with the Carriage business in this city and the artist's who sell their works in public space.
" Motivated largely by self-interest, St. Augustine's business community generously supported the pragmatic values and aesthetic conservatism began to stifle creativity".We artists a have been at a loss to know just who is the driving force putting the vendors out of business under the color of unconstitutional ordinances. Unlike the carriage companies who provide a service, we are all registered to collect and forward state sales tax on the artwork sold, There is a misconception that we do not comply. We display our tax certificates. There is a misconception that alternative spaces are available, other than the 1.The prohibited 120 ft. wide five block swath down the length of the historic Districts HP 2 and Hp3 2.Loring Park and surrounding cross streets, 2. Anderson Circle 3. The Plaza De La Constitucion and all surrounding cross streets.The truth is that most of the remaining streets are in neighborhoods, Flagler property or are unsafe for pedestrian passage. The Plaza as Federal Courts have determined is a park that is not only the quintessential forum for free speech but it is the safest public space to display and sell our art. 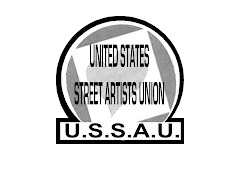 Though a license scheme for artists has been well settled as unconstitutional ( the city had refunded thousands of dollars in fees as the result of a challenge) it has been illegally re instituted at 75 dollars a month or 900 dollars annually to stay in one 10 x 10 spot in the slave market. A carriage that utilizes city utilities and travels the streets of the city pays now 50 dollars a year but would be 1000 dollars a year under the proposed ordinance. The current ordinance prohibits an artist from setting up an easel and doing a painting in the "prohibited area" We are told that it is not being enforced so....why is it there and why did four current commissioners vote for this after it was pointed out to them? The lottery for spaces is a farce...the rules ridiculous and the police have told us that the licensing is not being enforced.No one will wear the photograph that identifies them as a "street performer". Four of the current Commissioners voted by resolution in Dec 2009 to declare all property around the parking garage and The Visitor Information Center as no longer public property but is now "City proprietary property". Illegal doublespeak here. The city will claim that this is an acceptable alternative and foster a flea market with absolutely no rules and later declare it as not public property after they utilized the alternative claim in court. The same thing was done when St. George Street was prohibited but the Plaza was held up as a viable alternative. Now the Plaza has been banned for artistic activity. Mayor Boles has said that he does not want the artists taking up space when a day of celebration is had in 2012 for the Spanish Consitutional Monument. Why not ask us to not set up on special event days, if it interferes with the event? This was the way it was handled in the past with no problems. Grass problems? A revolving location was worked out in years past with no problem. We have requested numerous times to be able to sit down with city administrators to work out a constitutionally viable ordinance that respects first amendment rights. We have never received the courtesy of a response. It was felt that our new City Manager Mr. Regan would put aside the adversarial attitude of the former City Manager Harriss. We are disappointed. First amendment activity occurs almost every weekend with Christian or Krishna Consciousness devotees playing music and using megaphones. 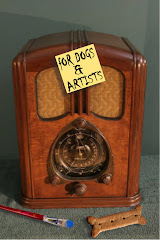 Our activites as artists has no less first Amendment protection as they do. 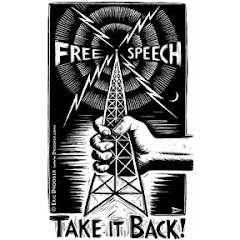 Thre courts recognize that charging for a first amendment protected item does not remove or diminish First Amendment Rights. There are over eight newspaper vending machine in the Plaza area alone. These are protected just as our art is protected. Your city attorney's argument that County Judge Tinlin said none or all must be permitted is just plain untrue and would make no logical sense when the first amendment is applied. That same attorney will tell you that Federal Judge Marcia Morales Howard declared the previous ordinance invalid. She did not...she simply stated that it cannot be enforced against visual artists. Merchandise that is not First Amendment protected had already been banned in the ordinance . That's when the city opened up the Plaza to all sorts of merchandizing creating an unregulated situation that they later said needed control , though they actually fostered the chaos. So Commisioners Leary and Freeman,your statements on unfairness and how to treat people ring false to me. I have never seen a flea market vendor jailed for being on public property nor has a carriage owner been jailed. The City has put the street artists out of business illegally. 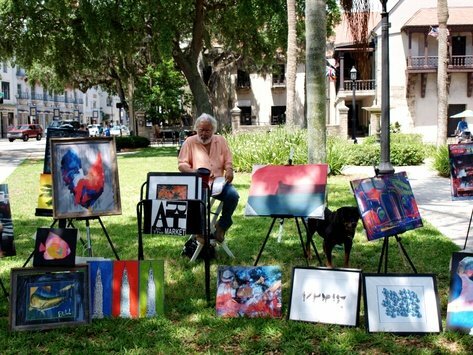 Three of the artists who remain in the shadows are struggling They have been selling their art outside in St. Augustine for a total of 36 years between them. I can assure you that world wide more people know these artists and their artworks than any other artist in this city. Yes,Commissioner Leary, the tourists love the carriages and they also love the artists. They tell us this every time we are out there. Next week the city is once again pursuing three of six criminal charges against me for being in the Plaza with my art. These are illegal charges but I have found that as a defendant in a county court I cannot expect constitutionally sound decisions. Regardless of the Court's findings. I will continue to to display and sell my art in the Nation's oldest park as long as I am able. How about you? Will you continue to disregard the plight of taxpaying entrepeneur artists who ask for nothing but the recognition of their rights? 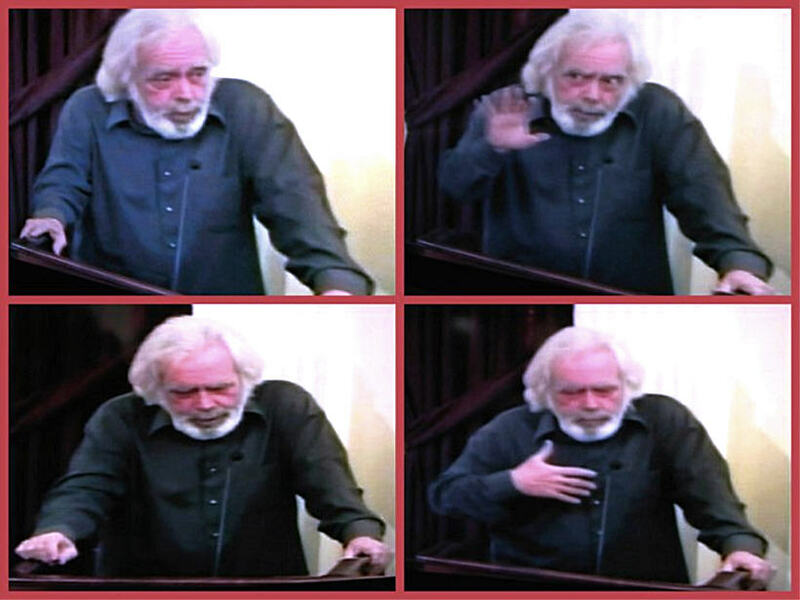 At last Monday's City of St. Augustine City Commission meeting artist Gregory Travous spoke during the public comment period. He reminded the Commission of the two year old Federal Court decision favoring the artists in their fight for constitutional rights to display, create, and sell their artwork on public property. Travous also stated that he is being prosecuted next month in St. Johns County on newer charges though they are the very same ordinance citations that were vacated as a result of the previous court decision. It was proposed by the artist that the city drop all criminal charges against him and to sit down with the three remaining artists to work out a constitutionally viable ordinance that will end the years of harassment. Travous is currently reported to also be waiting for hell to freeze over. Part of being creative is learning how to protect your freedom. That includes freedom from avarice. The Oldest City In The U.S.